Moving the Chains was produced for CompuSports Radion by Coach Big B - Bernie Hayes of The Red Zone Show. Coach Hayes is arguably the founder of Talk Radio for Football Coaches, and we were fortunate to have been able to bring a series of shows to CompuSports Radio listeners. Moving the Chains guests are well known football coaching clinic speakers, including many who were also on The Red Zone Show. Moving the Chains Volume 10 - Coach Paul Golla visits Moving the Chains to discuss his Flexbone Offense. This is the finalize in this special series produced for CompuSports Radio by Coach Big B, Bernie Hayes of The Red Zone Show. Moving the Chains Volume 9 - Coach Ron Jenkins returns in Part II of his interview on Moving the Chains. Coach Jenkins discusses short passing routes and their role in the short passing game. Moving the Chains Volume 8 - Coach Denny Dierick talks about the Outside Veer play with Coach Big B in this edition of Moving the Chains. Coach Dierick discusses blocking schemes and adjustments to different fronts, play action passing off the Outside Veer, complimentary plays, shifting, motion and more in a show that should be of interest to coaches on both sides of the ball. Moving the Chains Volume 7 - Coach Jeff Miret talks about using a “Hurry Up Offense" in a Multiple Offensive attack. 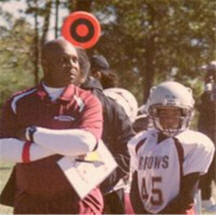 Coach Miret is a highly successful coach with experience on both sides of the ball at the Youth and High School levels. Moving the Chains Volume 6 - Coach Terry Cox talks about his 521 Defensive Scheme as well as his new 400 page 3-3-5 defensive playbook on this edition of "Moving the Chains". Coach Big B and Coach Cox give away a free playbook to a lucky listener as well. Moving the Chains Volume 5 - Coach Ron Jenkins, high recognized authority on the West Coast Offense, visits with Coach Big B on this edition of Moving the Chains. Coach Jenkins brings his 16 years of experience coaching offensive football at the community-college level in Southern California to this, the first in a 3 part series. Coach Jenkins is the Founder of The Top Gun Quarterback Academy. Moving the Chains Volume 4 - Coach Jason Eck, Offensive Line Coach at Hampton University visits with Coach Big B to talk about Offensive Line play. Coach Eck, a graduate of the University of Wisconsin, has over ten years of college football coaching experience, including stints at Ball State, Winona (MN) State, University of Colorado, University of Idaho, and his Alma mater, the University of Wisconsin. Moving the Chains Volume 3 - Coach Dennis Caryl returns to talk more about the Bear 4-6 Defensive scheme, stunts and adjustments. Moving the Chains Volume 2- Coach Dennis Caryl visits with Coach Big B on the Second Edition of Moving the Chains that focuses on Defense. Coach Caryl, who studied the Bear 4-6 Defensive scheme under Coach Buddy Ryan, talks about the scheme in this edition of Moving The Chains. Moving the Chains Volume 1 - The first edition of Moving The Chains, a new show produced for The CompuSports Radio Network by Coach Big B (Bernie Hayes) of The Red Zone Show..
Coach Hayes was joined by four well known High School football coaches who discussed the March 2011 Mid-Atlantic Wing and Things Clinic . Participating in the Round Table format commonly heard on the Red Zone Show were Coach Glen McNew, Coach Lew Johnston, Coach Tom Buzzo and Coach Cecil Phillips. Having trouble listening to Moving the Chains on our player? Contact Us to request a link to an MP3 file that you can listen to in Windows Media Player, on your Mac or on any MP3 player.